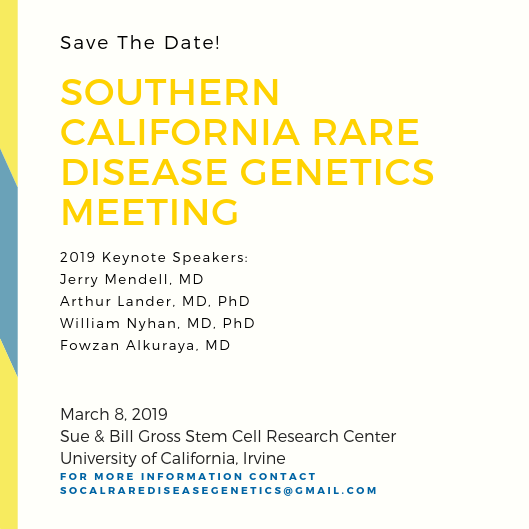 Dr. Virginia Kimonis and the Division of Genetic and Genomic Medicine invites healthcare providers, researchers, and patient organizations to the Sue & Bill Gross Stem Cell Research Center in Irvine for the inaugural Southern California Rare Disease Genetics Meeting on March 8, 2019 8:30 - 5:45 PM. There will also be oral and poster presentations and opportunities for networking. CME credits will be available for physicians and CEU credits for genetic counselors. *As of February 25, we have reached registration capacity. If you are intersted in being added to the waitlist or participating via ZOOM, contact socalrarediseasegenetics@gmail.com.